So you’re looking for the perfect gift for one of the most important men in your life: your dad. With Father’s day just around the corner, it’s time to say thank you to the man who taught you how to ride a bike, tie your shoe laces, and showed you how to be an all-around great person. This year, skip the tie. Whether shopping for your own dad, a brand new dad, or all of the dads in-between, we’ve got something for everyone. Not only have we picked our favorites, but we also have a perfectly curated gifts for dads shop where you can find all of your Father’s Day needs. De Facto Backpack – This bag is an excellent alternative to a briefcase. Whether heading to work and in need of bringing your tech items, or going away on a weekend getaway, this backpack is perfect for any occasion that may arise. 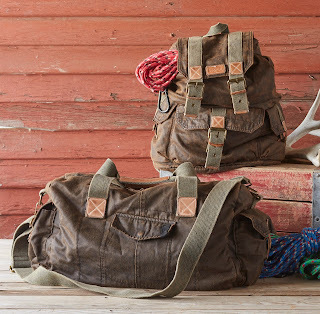 This waxed canvas and leather backpack is soft and spacious, but rugged, with four pockets, drawstring closure and adjustable, padded carry straps. The De Facto Backpack is durable and will keep dad on trend. Prophets And Moguls, Rangers And Rogues, Bison And Bears Book – The title says it all. This book was created in celebration of the National Park Service. Travel journalist Heather Hansen recounts how the NPS came to be and the people who worked tirelessly to create these scenes from your family vacations. She notes that the National Parks are the “biggest, real-world laboratory on the planet, and an eyewitness to American History.” This 352-page book is a great read and will help him recount the memories of past family vacations. Leather Bluetooth Speaker - For the dad who's a techie with impeccable style. Your dad can enjoy all of his favorite good music in style with this handsome Bluetooth speaker and leather carrying case. The speaker provides more than eight hours of music play and functions as a hands-free speakerphone for incoming calls for when you call to wish him a happy Father's Day. Simple Rhythm Watch – This watch is for the dad who is always on time. With clean lines and a thick leather strap, this watch will go with any outfit he chooses. Being versatile, the watch can be worn during work and play. It’s the perfect gift for any dad who loves essential and durable accessories. Finally, if none of these other gifts speak to you and you want to get a gift that will blow him out of the water, consider giving him the blast from the past gift of the Classic Shuffleboard Table, or the Chesterton Bar Console. The shuffleboard provides the joy of childhood games, with attention to the finest of details. This sure-to-be-heirloom piece is crafted with reclaimed hardwood, distinct cast iron legs, steel and high-durability, lacquered white oak. This shuffleboard is perfect for the dad who is still a kid at heart with a penchant for the classics. 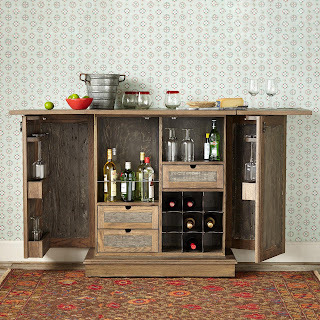 The Chesterton Bar Console is for the dad who loves to entertain and enjoys a good drink at the end of the day. The console, made of reclaimed oak and douglas fir, opens to reveal cubbies for wine, brackets to hang wine glasses, shelves for bottles, drawers for storage and an expandable tabletop. The Chesterton Bar Console will be a definite hit with dad. For more gift ideas, shop our entire Gifts for Dad shop here.